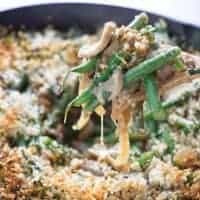 This healthy green bean casserole is a sophisticated and lightened up version of the classic recipe that has been around since the mid-1950’s. There is something about Thanksgiving that brings to mind specific foods. You gotta have Turkey and mashed potatoes. Then there are the candied sweet potatoes. Cranberry Relish. Pumpkin pie. I could ramble on and on about all the sides that need to make their appearance on Thanksgiving. I don’t know of any other American holiday that calls for so many choices. Too many choices to be honest. Yet, you have to satisfy the hangry crowd. But all those choices lead to an overindulgence of fat and calories. 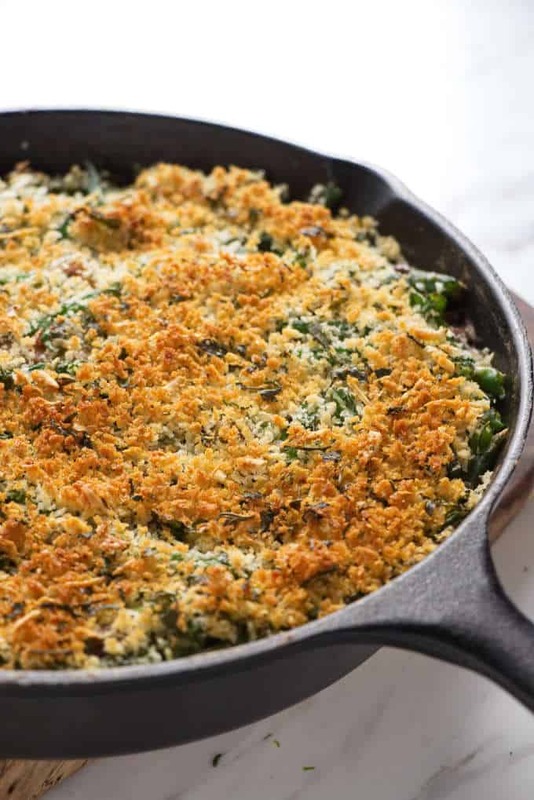 Green bean casserole is one of those expected side dishes. 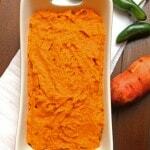 It is also a side dish you can easily lighten up without sacrificing flavor. 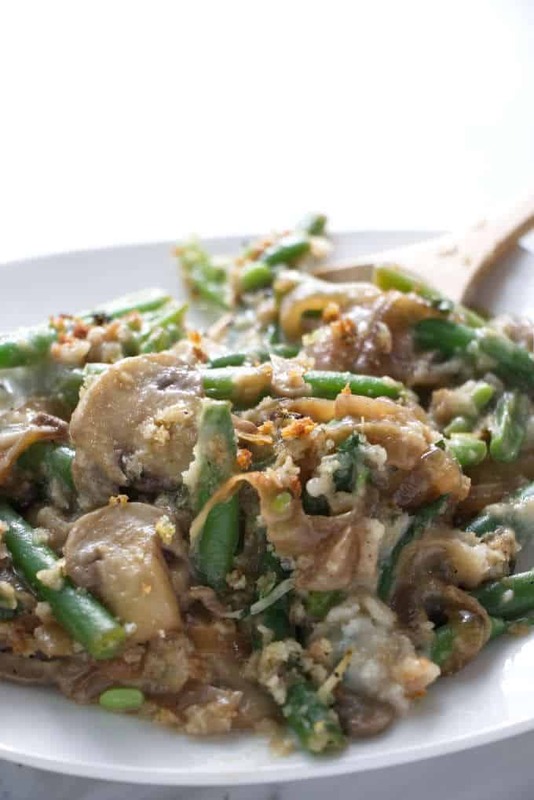 As a matter of fact, you can turn green bean casserole into a healthy and sophisticated side dish. 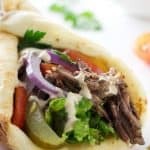 If you can’t muster up the thought of opening up sodium laden cans of cream of mushroom soup then this recipe is for you. We start out with fresh green beans. That’s what you gotta do for a healthy green bean casserole. The problem with fresh green beans is the time it takes to wash and trim all the beans. And time is at a precious minimum when you’re preparing a feast like this. Don’t worry. Many stores sell green beans that are already washed and trimmed. Thank you, Costco! Toss the green beans in some boiling water for about 5 minutes then drain them and toss them into some ice water. You want to shock them in the ice water so they don’t continue to cook and get mushy…. Unless you like mushy, overcooked green beans. If you do, I’m sorry… errr…. just let them sit and over-cook. Instead of adding a can of crispy fried onions on top of the casserole, we sautéed the onions until they caramelized and turned a deep golden brown. Browning the onions will add flavor and richness to the dish but we amped things up a bit and added a dash of balsamic vinegar. Next, make the mushroom sauce. Fresh mushrooms take a bit of time to cook down and release all their liquid. It’s worth it though because the flavors get concentrated and so yummy. This is where the biggest calorie swap happens. We aren’t afraid of cream and butter around these parts. We have plenty of that stuff in our kitchen. But you aren’t going to have a lightened-up creamy mushroom sauce if you use that stuff. We replaced the fattening cream and butter with almond milk and chicken broth. That means we gotta add back some flavor that the butter and cream took with them. One way we added some extra flavor was when we caramelized the onions in the step above. The next thing we did was add a splash of white wine. Make it some good wine so you can drink the rest of the bottle with dinner. Then we added garlic, parmesan cheese and a hint of nutmeg to round it all out. Instead of a can of crispy fried onion rings on top, we used crunchy Panko bread crumbs and parmesan cheese to make a crisp topping. This isn’t your grandma’s canned soup casserole. When you compare this healthy green bean casserole to the original recipe created in 1955, you save over 100 calories per serving. 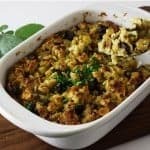 This casserole has 110 calories vs 227. The biggest swap, however, was in the fat. There are just under 4 grams of fat per serving in this healthy green bean casserole but the original version has a whopping 15 grams of fat. 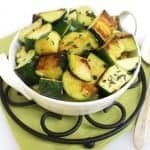 CAN YOU MAKE THIS CASSEROLE AHEAD OF TIME? You definitely can make this casserole ahead of time. 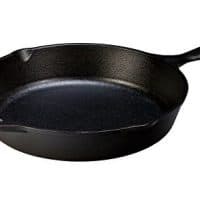 After you cook the beans and make the mushroom sauce, combine everything in a baking dish or cast iron skillet then cover it and freeze it for up to two weeks. When you are ready to eat the casserole, place it in a pre-heated oven at 350°F for 45 to 50 minutes. Sprinkle the Panko topping on during the last 10 to 15 minutes of bake time. 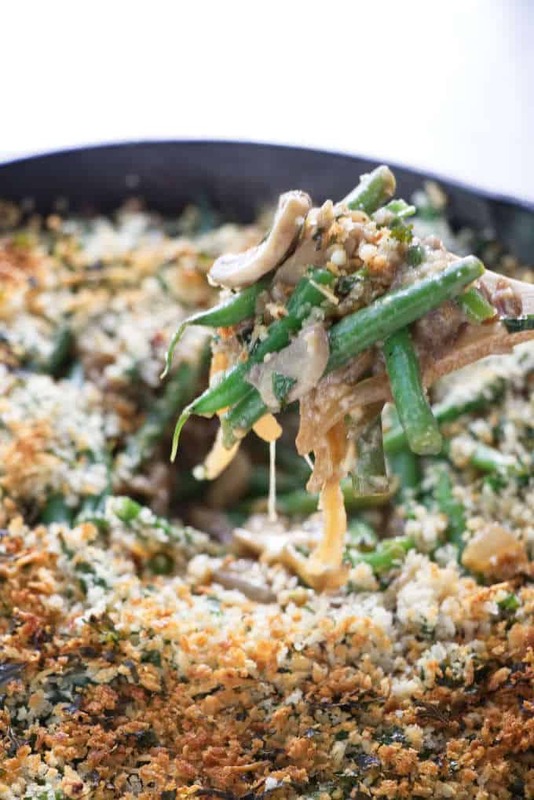 This healthy green bean casserole is light on calories and fat but big on flavor. Combine the Panko bread crumbs, parmesan, parsley, olive oil, and salt in a small mixing bow. Stir until well combined and set aside. Bring a large pot of water to a boil and toss in a tablespoon of salt. When the water boils, add the beans and cook for 4 to 5 minutes. While the beans are cooking place some ice water in a large bow. When the beans are finished cooking, drain them in a colander and then dump then in the ice water to stop them from cooking. Set them aside. Heat the olive oil in a large oven proof skillet then add the onions. Cook the onions for 10 to 15 minutes, stirring occasionally, until they are dark brown. Add the balsamic vinegar and cook for about a minute longer. Scrape the onions into a bowl and set them aside. Add the sliced mushrooms to the same skillet that you cooked the onions. Cook the mushrooms stirring frequently. 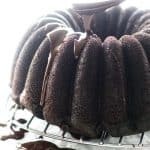 They should release some liquid, then continue to cook them until most of the liquid is evaporated, about 8 to 10 minutes. Add the minced garlic to the mushrooms, then add the flour and cook for 1 to 2 minutes. While continually whisking, slowly pour in the wine, chicken broth and almond milk. Bring the mixture to a simmer while stirring frequently. Cook for 5 to 6 minutes until it has a thick gravy consistency. Stir in the Parmesan cheese, salt, pepper, and nutmeg. Stir the onions into the mushroom mixture then toss in the green beans until they are all combined. 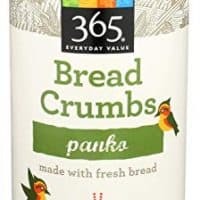 Sprinkle the Panko bread mixture on top and place it in the oven for 15 to 20 minutes. We eliminated cream and butter from this casserole and replaced it with low fat almond milk. 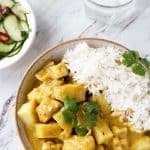 In order to replace the flavor that comes from the fat and butter, we added a splash of white wine and chicken broth to the sauce along with a dash of nutmeg. We browned the onions to enhance their flavor then kicked it up a notch by adding some balsamic vinegar. We switched the cheese to parmesan which is naturally low in fat but has a ton of flavor. The result is a delicious green bean casserole that won’t weigh you down. 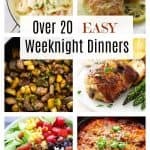 After you cook the beans and make the mushroom sauce, combine everything in a baking dish or cast iron skillet then cover it and freeze it for up to two weeks.